The celebration of Chinese new year is based on the belief of lunar calendar month--also marks the beginning of the spring season. It is widely observed by the Chinese in many countries of the world where they have formed a community known as the 'Chinatown'. Chinese new year brings hope, good luck and prosperity among people. It is the beginning of another year full of positive aspirations to achieve for self, family and community as a whole. The colorful festivities in dominant red is known to bring abundance and to spare negativity in any form. On this special day, people wear red color shirt and make home decorations in red that symbolizes prosperity. Since majority of the Chinese are engaged in a business, they always put something red in their buildings to attract wealth for the new year and beyond. In Binondo, one of the busiest and populated district of Manila is the place for the Filipino-Chinese community or popularly called 'Tsinoy'. Although they are found in various places of the Philippines, the major population and highest concentration of their population is located in the Chinatown of Binondo, Manila. 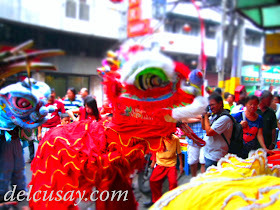 I was lucky to have witnessed and celebrated the event with the 'Tsinoys' in Binondo. My trip started with a little prayer in the Minor Basilica of San Lorenzo Ruiz or known as the 'Binondo Church'. This is where the 'Tsinoys' of Christian faith usually go to pray and strengthen their spiritual life. Few steps from the church is where the journey commence, in the old street of Ongpin. There are variety of Chinese merchandise offering products and services in this busy street. Gold shops of high quality can be found in this narrow yet vibrant place. There are restaurants catering authentic Chinese cuisine and one of which is the 'President's Grand Palace' and the 'President's tea house' to relax your senses. There are shops catering Chinese delicacies like the famous 'Eng Bee Tin' that produces tikoy and hopia in different variants and flavors. I've seen people falling in a long line just to satisfy their cravings for this food that is said to bring good luck. The 'tikoy' is made of glutinous rice flour which is sticky, thus symbolizes a family and relationship that is well bonded according to Chinese norm. The most common business in Ongpin is the lucky charms and decors. There are so many jewelries for different purposes depending on form and color. One has to wear a particular bracelet or necklace to attract prosperity and to drive away bad luck. 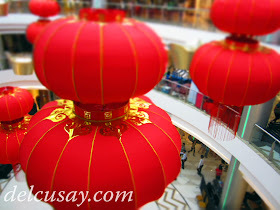 For home decoration, there are red lanterns in various sizes and forms to symbolize wealth and good luck. Perhaps one of the most exciting part is to witness the lion dance. This mythical Chinese creature dances gracefully as it is maneuvered by several dancers. 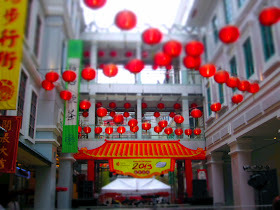 They perform lion dances from one shop to another for an opportunity to receive angpao or the red envelope with money. They have never failed to entertain the business owners in a presentation that is well rehearsed and choreographed. There is also a dragon dance, but it is quite long and carried by several dancers. Like the lion dance, it is also a powerful mythical creature in a Chinese culture. It is to spare negativity in business, house and the environment. Both dance presentations are seen throughout the new year celebration in Binondo, particularly in Ongpin. It is colorful, entertaining and attracts a crowd. In a traditional Chinese family, 'angpao' is given to the unmarried and usually children. The little kids fall in line and patiently wait for their turn to receive 'angpao' from the elderly or their grandparents. They are expected to greet happy new year in chinese language as they receive it, but they are not supposed to open the red envelop until they ran away from the giver. In The Chinese new year, there are several ways of greetings; in a language known to them. Whether you hear the greetings 'Kung Hei Fat Choi', 'Gong Xi Fa Chai', or 'Kiong He Huat Tsai', it is all valid form of new year greetings. It does not literally mean 'Happy new year' but it means congratulating and wishing someone for prosperity. In the Philippines, the common greetings is 'Kung Hei Fat Choi' and it has been made a standard greetings in media and other printed publications. It is a Cantonese greetings, usually spoken in Hong Kong and Macau, but the 'Tsinoys' speaks 'Hokkien' and prefers the greetings 'Kiong Hee Huat Tsai'. However, no matter what language or dialect is spoken for greetings, there is a spirit of understanding and it sends a single message of 'Happy New Year!'. In the Chinatown mall is where I have witnessed the cultural presentations from different groups. They have presented charming Chinese folk dances, the melodic choral, and the exhibitions of Chinese martial arts like 'Wushu' and Tai Chi'. There is also some modern Chinese hip hop that captures the attention of the younger generations. It is a day-long event until the countdown for new year is observed and fireworks is witnessed to lighten up the evening. The Chinese people loves to preserve their heritage and they have a greater influence in culture, food, social norms and beliefs. In the Philippines, people are familiar with the 'feng shui' and this is attributed to good luck, happiness and prosperity in businesses and houses. There is also the 'horoscope' where people consult their luck or destiny in a particular day, month or year depending on zodiac sign and animal sign you were born. Also Filipinos are fond of eating noodles and soups brought by the Chinese since long time ago. Although the world constantly evolves and the culture of peace and freedom is changing, there are so many things we should learn from the Chinese. Perseverance and endurance at work accompanied by humility and gratitude is what made them achieve success in the family, career and life in general. The Chinese culture has its own uniqueness and their customs being extraordinary makes us multi-cultured people. Our beliefs should not be restricted to what has been instilled since birth. Open mindedness and acceptance in faith and cultural differences brings a peaceful and vibrant living. We learn from each other and the wisdom gained is what truly brings good luck and prosperity in our lives no matter who and what we are; and no matter who we will become.